I offered to make a dessert For my brother in law’s birthday. I wasn’t sure which direction to go, whether to make a classic layered birthday cake, or do something less traditional. According to his lovely wife, kaitlin, he loves bread pudding and he loves fine spirits. Based off of that information, I decided to mash up two of his favorite things! 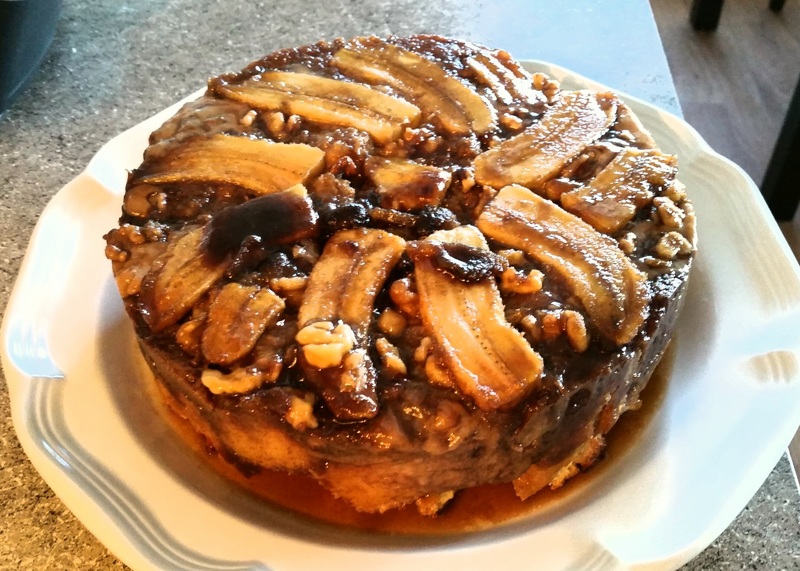 Bananas foster is a classic dessert born out of New Orleans. 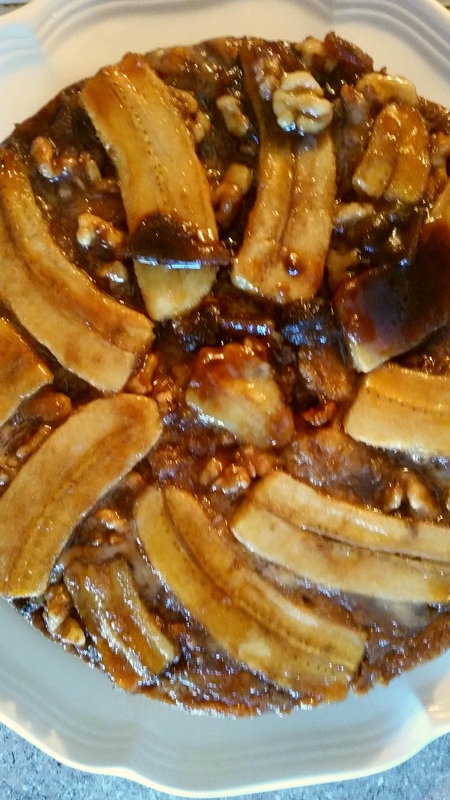 It’s made in a pan with butter, brown sugar, sliced bananas, usually a banana liquor, and some brandy or dark rum. The alcohol gives flavor and allows you to set your bananas a-flame. It’s a fun and theatrical dish! And bread pudding is so amazingly delicious. Tools you will need: a 9inch spring form pan, a large mixing bowl, and a sheet tray. slice bananas. (I cut mine in half and sliced them length wise, but you could cut them however you want) place in a shallow dish and pour the 4tbsp of brandy over them. Set aside. In a large bowl, whisk together the milk, sweetened condensed milk, eggs, cinnamon, salt, and vanilla. Take bread out of the oven and set the oven to 375. Put the bread in the wet mixture and let it sit for several minutes, letting it soak up the goodness. Lay the banans on top of the butter and brown sugar,and pour any remaining Brandy in the pan. Then sprinkle the walnuts over top. carefully spoon the soaked bread over the bananas, our any excess liquid into the pan. Press down firmly so that there aren’t any huge air gaps. Put spring form pan on your sheet tray just in case it leaks. Put in oven and bake for about an hour. The bread will look golden brown and springy to the touch. Allow bread pudding to cool 15-30 min before inverting on a serving dish. Good luck on trying not to devour this all at once! I served mine with a Creme Fraiche with a touch of cinnamon and maple syrup. You could also serve it with ice cream or fresh whipped cream. Please make this for my birthday — I’ll supply the ingredients! And, may my son ever know how blessed he is to have you!! I must say, having tasted this myself…IT IS INCREDIBLE! James and I have had the pleasure of eating it for breakfast these last few days as well as the Birthday Dessert and we don’t want it to go away! Unfortunately, the cake is slowly getting smaller and smaller! Thank you for sharing the recipe! I will be making this in the future! It is utterly sinful!